Carl’s Jr. showcases, in a new ad, its “high and meaty” Pastrami Thickburger, which is back on the chain’s menu for a limited time. “Bye, bye, condiments. 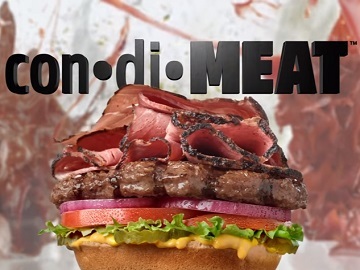 Condimeats is in the house,” the voiceover says at the beginning of the 15-second spot, which features the burger, made with juicy pastrami on a 1/3-lb. charbroiled Black Angus beef patty, red onion, lettuce, tomato, pickle and mustard, all on a premium bun. “Juicy pastrami on Black Angus beef. It ain’t squeezed on, it’s layered on. The Pastrami Thickburger, only at Carls Jr.,” the voiceover also says. First introduced on the menu in 2004 for a limited time, the Pastrami Thickburger was brought back in 2006. This fall, it will also be available for a limited time only, at participating locations, in a single, double and a 1/3 pound Thickburger.